This week's issue of Nature is out today, and you'll find a story of mine called Project Earth is Leaving Beta waiting for you on the Futures page. You can also read it for free on the Nature website, along with all the other Futures stories published each week. 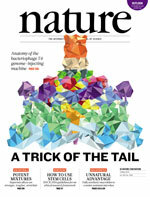 I'm delighted to see my work featured in the pages of Nature once again. I'm just as tickled as the first time around (Möbius), that one of my silly little stories somehow managed to find a home in a respected science journal. And silly is perhaps an accurate descriptor for Project Earth is Leaving Beta. It's a humorous piece written in the style of a Kickstarter update sent to backers of "Project Earth," the elaborate MMO game that is our lives. It was a fun little premise to play with, and some of the tidbits within have borne out in reality since I wrote it, which makes me feel like one of those genuine sci-fi prophets. Okay, so it's not exactly Arthur C. Clarke predicting the geostationary satellite, but hey, I'll take whatever I can get!